There were five Mam'selle fashions especially made for Paul including two smart new suits which reflected the fashions of the day. 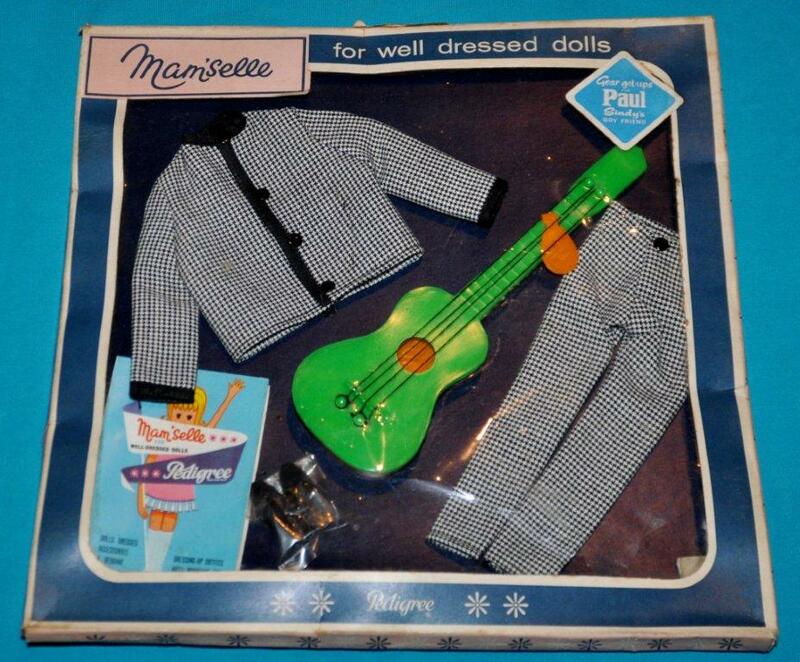 Because Paul wasn't so popular, some of these outfits are now very hard to find. Paul's underwear was a vest and Y-front pants made from a fine white cotton mesh edged with a white cotton trim. The set included a magazine for Paul. Thank you also to the kind collector who carefully took the carded outfit out of the original box for this photograph, so that you could see the detail of the boxed outfit. The third & fourth photos below show a close up of the magazine (with Sindy's car on the front cover). An all-in-one, zip-up cotton jersey track suit. It was a rust colour with the collar and wrist & ankle cuffs made of a contrasting mustard colour ribbed fabric (which was the same material as used for Sindy's 'Gad Abouts' jumper and the sleeves and neck of Patch's 'Autumn leaves'). On Paul's left chest a torch was printed in mustard and white, and was described in the brochure description as a "club emblem". The outfit came with a pair of Paul's white lace-up sneakers. We thought the torch might be something to do with the Olympics, but we can't match it - could the torch be something to do with car racing? A Beatles inspired suit consisting of a collarless jacket and trousers made of a fine silky cotton black and white houndstooth check. The edges of the jacket were trimmed with a black cotton binding and it fastened with four black flat painted poppers. The trousers had a front fly opening and fastened with one flat black painted popper. For his feet Paul had a pair of black chelsea boots and he carried a green plastic guitar. 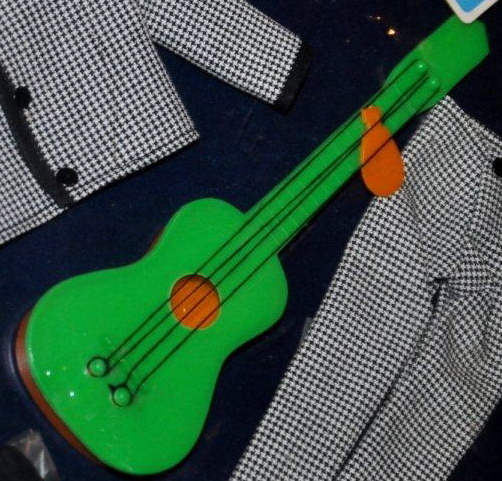 As you can see from the MIB (Mint In Box) photos below, the green guitar had an orange back and it was strung with black string. It also came with an orange plectrum. A grey felted wool single-breasted suit with a collar, notched rever-lapels, two slanted faux-flap hand pockets, and a single faux-breast pocket on the left chest containing a off-white satin handkerchief. The jacket fastened at the front with three flat black painted metal poppers and the trousers had a front-fly opening fastened by one flat black painted popper. Under the jacket Paul wore a white, striped cotton long-sleeved shirt with a fine red, pink & mauve vertical stripe, it had a white vinyl collar and it fastened at the front with two flat white painted metal poppers. The suit came with a red tie (not shown), it was made of the same material as the hanky and it was shiny with a criss-cross pattern. This outfit was worn with black Chelsea boots. We have only ever seen a photo of this outfit and it consisted of a black cotton-backed black vinyl zip-up bomber jacket and matching trousers. The jacket had a collar, two front pockets with flaps and a fitted waist band which fastened with one flat chrome coloured metal popper. The trousers had a front-fly opening fastened by one flat chrome coloured popper. There was also a white motorcycle helmet with a green visor and a black chin strap. The brochure also refers to boots. As we don't have this outfit, we cannot provide any more detail and we would be pleased to hear from anyone who has the original outfit which they would be happy to show here and who could provide the detail that we do not have (duly acknowledged of course).